“Mr. Fishman’s story — as a refugee, a seeker and an insatiable eater — is inherently compelling. But the book’s brilliance lies in the author’s self-awareness and honest appraisal of his, and his family’s shortcomings. He writes from the perspective of someone who learned to be comfortable being uncomfortable in his own skin — someone with no secrets left to keep”: The Wall Street Journal on Savage Feast. “Perhaps it’s no surprise, then, that the list of great recipe-plus books—memoir/novel-plus-recipes; recipes-plus-personal essays—is long and rich… And then there are the stories by writers-first-cooks-second that are just particularly well-illustrated through food”: Vanity Fair singles out Savage Feast. The New York Times Book Review on Savage Feast. “From Minsk to Midwood, A Moveable Feast”: The Jewish Week on Savage Feast. A true publication-day present: Savage Feast is the #1 Best Seller in Culinary Biographies and Memoirs on Amazon. Boris has an essay in Saveur about his favorite recipe in Savage Feast, along with some very beautiful photos of the dish. ‘Cooking Up A Story’: A profile in The New Jersey Jewish News. “Fishman’s writing is brisk and vivid, and despite generations’ worth of trauma the family suffered, from pervasive anti-Semitism to the brutalities of World War II, his memoir is often funny… This book departs from other memoirs: Most chapters end with detailed recipes, adding a lovely, homey dimension.”: A review of Savage Feast in BookPage. The Jewish News of Northern California on Savage Feast. “Tonight, as a reward for finishing this piece, I plan to make Oksana’s borsch, substituting celery root for parsnips, since that’s what I found at the store. I can already tell you, in other words, that I won’t follow the recipe. As Savage Feast renders in such beautiful terms, none of us do: It’s as subject to revision as we are.”: Paste Magazine on Savage Feast. And another in Tablet (with a recipe, natch). A Q+A with Deborah Kalb. “Fishman skillfully avoids portraying Oksana, who has played a critical role in his life, as a matronly, obliging caregiver who exists for the purpose of serving his family. He depicts her with obvious affection and sensitivity, but also with some distance, perhaps as an acknowledgment of his lack of access to the inner life of a female migrant”: The Los Angeles Review of Books on Savage Feast. Savage Feast is the Editors’ Pick in Biographies and Memoirs on BookBub. Boris answers some questions for LitHub. An interview with the Forward, and a recipe, too. Savage Feast is one of Amazon’s Best Books of the Month! “Funny yet moving… this beautifully written memoir is a wonderful story about family, love, and connecting with your roots,” Library Journal says. Savage Feast is the Featured Book in the Princeton Alumni Weekly. Savage Feast is a Winter 2019 Must-Read Nonfiction pick at Bookish. If you’re curious how the writing gets done, sometimes Glacier National Park and the bathroom paper-towel dispenser are involved. Boris introduces Electric Literature’s excerpt from Dina Nayeri’s “Refuge,” a novel as incisive as it is poignant about Iran, families genetic and inherited, immigration, and so much more. A certain Boriss Fišmens is on Latvia’s version of NPR. Rodeo, just out in paperback, is a “Paperback Row” selection in The New York Times Book Review. The New York Times has just named Rodeo one of the 100 best books of 2016. The Boston Globe asked me and several others to pick two books that explain Russia. At least a little. Boris talks with Martha Frankel of Woodstock’s Booktalk Radio (Episode 129). A rave for the newly-released paperback from Paperback Paris. An interview with Adam Vitcavage of Writer’s Bone. In advance of November 17th’s talk at the Kaplen JCC in Tenafly, a profile in The New Jersey Jewish Standard. They don’t make them like this any more: A smart, perceptive, hour-long (!) conversation about Rodeo on WNHH (New Haven)’s Book Talk, hosted by the great Cyd Oppenheimer. First a discussion of the book with Boris, then a round-table with two other readers. In October, 2016, Boris traveled to Estonia and Latvia on behalf of the U.S. State Department to discuss “A Replacement Life,” and the creative life (in America), with Russian-speaking minorities in the capitals and near the border with Russia. Some of the press highlights. Just in time for Boris’ move there, Brooklyn has issued a warm welcome: Rodeo is on the longlist — now the shortlist! — for the Brooklyn Eagles Literary Prize! A wonderfully in-depth and far-ranging interview with Mike Matesich of the Oxford Exchange in Tampa, where Boris is reading on Sunday, October 2. (See Readings.). In advance of a reading at NYU, a great talk with Rachel A. G. Gilman of “The Write Stuff” on WNYU. A lovely interview with Boris’ British editor. Foyles Bookstore in London was kind enough to reprint. Who doesn’t like his novel being called stunning? Rodeo is a Spring Reading Pick at the Times of Israel. Rodeo is an Editors’ Choice selection in The New York Times Book Review. BookPage, which chose Rodeo as its Book of the Day, and called it a novel of “unexpected force” (see below), asked Boris to talk about what he’s reading. Here’s the best book he read last year. An exceedingly intelligent and well-written profile of, and engagement with the ideas behind, Rodeo in the Forward by Talya Zax. Too rare such criticism these days. Rodeo is one of 18 Dazzling Books for Spring on the Oprah web site. A profile in the New Jersey Jewish News. What’s the literary equivalent of a no-hitter? Rodeo is racking up raves on every stop of its March tour of book blogs. Write-ups in English Kills Review and the New York Journal of Books. A return to WNYC’s Leonard Lopate Show for another great, meaty conversation. The Cyrus Webb Show (Mississippi). In advance of the March 15 reading at the Free Library of Philadelphia with Howard Jacobson, The Avid Reader (Philadelphia). Another lovely talk with Deborah Kalb. NPR with a rave for Rodeo! O, the Oprah Magazine gives Rodeo a thumbs-up in the March issue! A profile of the novel in the Princeton Alumni Weekly. Rodeo is among the “Winter Reads Authors Are Loving” on BookSparks. Boris’ Holiday Reading recommendations in the Princeton Alumni Weekly. A conversation with Elizabeth Stark and Angie Powers of the Story Makers podcast, aka the Stark & Powers Drama Hour. A lecture about plot for the University of Iowa’s Distance Learning Program. Publishers Marketplace has chosen Don’t Let My Baby Do Rodeo as a 2015-16 Fall/Winter BuzzBook; free sample here. A trio of summer reading recommendations, two old and one new, for Conde Nast Traveler. Boris in conversation with Gal Beckerman (“When They Come For Us, We’ll Be Gone: The Epic Struggle to Save Soviet Jewry”) and Yelena Akhtiorskaya (“Panic in a Suitcase”) at The Jewish Museum on May 19, 2015, moderated by Bari Weiss (The Wall Street Journal). A Replacement Life is one of three finalists, out of more than 150 books, for the Virginia Commonwealth University Cabell First Novelist Award. A profile of the Russian-Jewish literary wave, including yours truly, at the Calvert Journal. A really great interview with Rebecca Rafferty of the Rochester (NY) City News. A nice, long conversation with Evan Dawson of Connections on WXXI, Rochester (NY)’s NPR affiliate, in advance of Boris’s visit for Writers & Books’ Debut Novel Series April 9-11. A profile in Chicago’s JUF News. A profile and a review in the Cedar Rapids (Iowa) Gazette. In advance of a reading at Iowa City’s Prairie Lights, an interview with Little Village, Iowa City’s arts mag. A wonderfully in-depth talk with Kerri Miller of Minnesota Public Radio. A Replacement Life wins the 2015 Sophie Brody Medal for Achievement in Jewish Literature from the American Library Association. On the Soviet Union as a pioneer in local-and-organic (and GMO labeling); the role of food in the novel; and the world’s best borshch recipe. A review in the American Jewish World of Minneapolis. The novel has been named a finalist for the $100,000 Sami Rohr Prize. On the eve of a pair of readings, a profile in the Orlando Sentinel. To mark the paperback release, NPR re-aired its interview with Boris from last summer, and fresh talks with LA’s BookRadio and Orlando’s Functionally Literate Radio. A most gratifying capstone to a most gratifying year: A Replacement Life is one of The New York Times‘ 100 Notable Books of 2014. The San Francisco Chronicle also lists A Replacement Life among its 100 Best of 2014. By turns dark and funny, a conversation with Lev Golinkin, author of “A Backpack, A Bear, and Eight Crates of Vodka,” at The Barnes & Noble Review. Shakespeare and Co. chooses A Replacement Life as one of its three (!) Staff Picks of the Year! A Replacement Life is one of Buzzfeed’s 20-Under-40 Debut Writers You Need To Be Reading. Electric Literature names A Replacement Life one of the year’s best debuts. So does Books on the Table. A Replacement Life is one of the highlights in the year’s Jewish reading over at the New Jersey Jewish News. These days, the space to truly sink your teeth into a conversation, not to mention an interviewer who treats his metier as an art form and an intellectual opportunity, is a real rarity. After many — many — months in the oven, here’s one of the most interesting conversations I’ve had — about “A Replacement Life,” but also many things beyond — for The Rumpus. A Replacement Life is part of the the Fall Literary Preview at The Jewish Week. A generous review from Hadassah Magazine, and an affiliated Q+A. A Replacement Life is part of the discussion about recent Soviet-emigre literature at Public Books. A profile in the rag that started it all, the Wayne (NJ) Hills High School Patriot Press! A profile in J. Weekly, the Jewish newsweekly of Northern California, on the eve of a series of readings in the Bay Area. An interview on Aspen Public Radio’s First Draft with Mitzi Rapkin. A rave from the American Spectator! An interview on surviving the writer’s life at Writer’s Relief. A rave for A Replacement Life from The Jerusalem Post. An interview with Boris, a former New York Foundation for the Arts Fellow, on the NYFA website. A Replacement Life spent June touring a series of book blogs. A selection of what they had to say (PDF). Listen to Boris discuss A Replacement Life on the Books du Jour roundtable, hosted by Frederic Colier. “You should write a book about…” Great piece on the plot ideas that start filling your inbox after you’ve published a book, including a trio (love triangles, bar mitzvah crimes, and e-softcore) given to Boris. (See #5, 7, 9). Profile of Boris in Russia Beyond the Headlines. Some love for A Replacement Life from ArtsFuse in Boston! An interview with Deborah Kalb on her literary blog. A cover review, and a rave, for A Replacement Life in the Neworld Review! Hear Boris read from A Replacement Life on The Author’s Corner on Public Radio. Thumbs up for A Replacement Life from The San Francisco Chronicle. The man with the greatest voice in radio, Bob Edwards, interviews Boris on The Bob Edwards Show on SiriusXM. Over at NBC, Bill Goldstein says that A Replacement Life is “brilliantly conceived and just a delight even though it touches on all these harsh subjects.” It’s one of his four recommended Lazy Summer Day Reads! A Replacement Life is a New York Times Book Review Editors’ Choice! Listen to Boris talk about the novel on NPR’s Here & Now. A Replacement Life is Novel of the Week at The Week! Listen to Boris talk about the novel on Leonard Lopate. A Replacement Life is one of MSN’s 10 Best Beach Reads for June. Boris is on the world’s greatest literary podcast! Kind words for the novel from the Jewish Weekly of Northern California. Boris is profiled in the first and last word on all things Lower East Side, The Lo-Down. The Minneapolis StarTribune loves A Replacement Life! A Replacement Life is a Summer 2014 Barnes & Noble Discover Great New Writers pick! B&N’s interview with Boris here. Tablet Magazine features a podcast with Boris and a review of the novel. The Los Angeles Times chooses A Replacement Life for its Best Summer Books. The alma mater approves of a A Replacement Life. Tender/corrosive humor of Boris Fishman's (first) novel "A Replacement Life" & an audacity which Bernard Malamud would have admired. An interview with Michael Orbach of Jewcy. A conversation with Francesca Rheannon of the Writer’s Voice podcast. A profile of Boris by Susan Rienzo at the (Phoenix) Examiner. A profile of Boris by Sandee Brawarsky of The Jewish Week. The Oregonian loves A Replacement Life. An interview with Boris over at The Jewish Channel. Shelf Awareness has very nice things to say about A Replacement Life. A very lovely chat with Audrey Camp and Lacy Mayberry of the Postmasters podcast. “An ambitious young writer compromises his integrity for the sake of his Russian forebears in Fishman’s darkly comic, world-wise debut… Fishman thoughtfully raises questions of what Holocaust-era suffering is deserving of recompense. A smart first novel that’s unafraid to find humor in atrocity.” Read Kirkus Reviews on A Replacement Life here (PDF). Boris is one of the “inventive new voices” mentioned in an April 25, 2014 New York Times profile of hyphenated novelists. are all most enjoyable.” Read Booklist’s review of A Replacement Life here (PDF). Join Boris on May 1 at The Center for Fiction for a celebration of the great Bernard Malamud, who would have turned 100 this year. Event details and RSVP here; an essay about Malamud by Boris here. 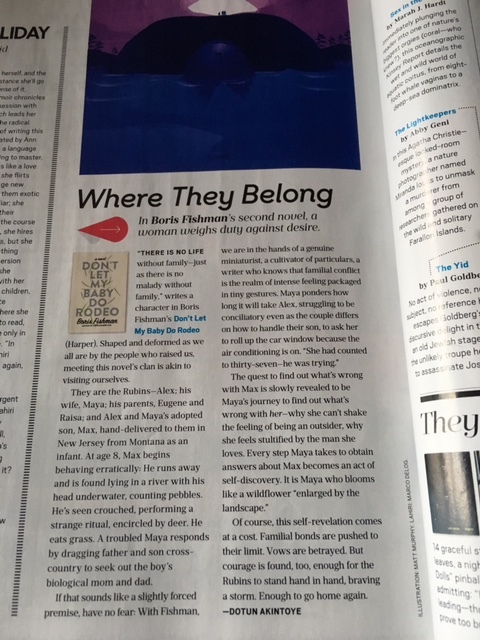 Boris is one of five novelists interviewed in Salon by Teddy Wayne, who will also be in conversation with Boris June 18 at BookCourt. A Replacement Life has been chosen for inclusion in Festival America, the French literary festival that celebrates Francophone work by American writers. September 11-14, 2014. A Replacement Life comes out in France (and the UK!) this fall! Followed by the Netherlands, Brazil, Israel, and Italy. The cover of A Replacement Life was chosen by Interfolio – yes, that place that mails out your recommendation letters – from hundreds of submissions for inclusion in its Scholar Gallery in Washington, DC. “Fishman, an émigré from Belarus, captures the complexities of family, nationality, and history as he cleverly ties the loose ends of truth, justice, morality, and family into a tidy bow in his first novel.” Read Library Journal’s review of A Replacement Life (subscription required). Or read it here (PDF). Read Publishers Weekly’s Q&A with Boris (subscription required). Or read it here (PDF). “The debut novel from Fishman shines with a love for language and craft.” Starred Publishers Weekly review for A Replacement Life! The Forward says A Replacement Life is one of 5 Books to Read in 2014.